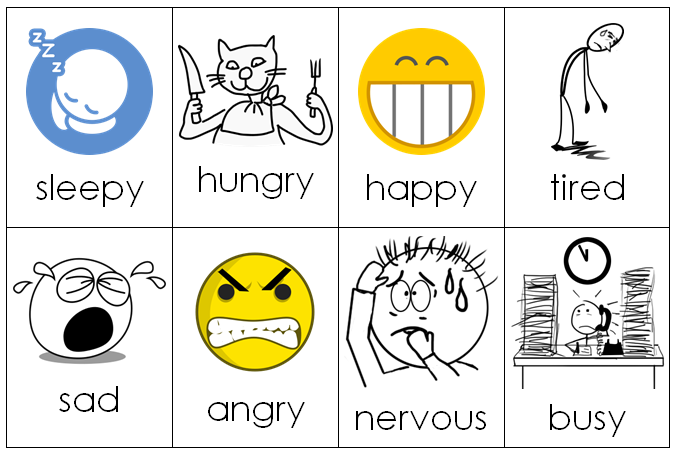 This is a set of multipurpose cards featuring the emotions “happy, sad, angry, nervous, sleepy, tired, hungry, and busy.” They are best used for teaching emotions and “how are you?” to 1st grade junior high school, or elementary school. Some games you can use with these cards are the Jyan Ken Card Game (http://letsteachenglish.com/view_activity.php?a=64), Go Fish (http://en.wikipedia.org/wiki/Go_Fish), or even Karuta (http://letsteachenglish.com/view_activity.php?a=60). Below is an example of how you might use the cards. The introduction and activity should take about 15-20 minutes with JHS 1st graders. Elementary school will more likely take a bit longer. Once you've finished that, drill the kids a few times on the words by pointing at the drawings (not in order) on the board and asking them what each emotion is. You can turn this drilling into dialog practice by asking “How are you,” and having the students reply “I'm happy (sad/tired/etc).” Do this until the students seem to have the vocabulary and dialog down. After this, you should be ready to play a game with the students. Give each student 3 cards (or more). Have them stand up, walk around the room, and play rock-paper-scissors with each other. The loser must ask “how are you,” and the winner replies “I'm [emotion].” If the loser has the card with the emotion indicated by the winner, he has to give it to the winner (and could say “me too” if you desire). If the loser doesn't have the card, he doesn't have to do anything, and you can tie it up with some ending phrase of your choice. Make sure to have extra cards; some students will run out of cards, and you will want a few extras to give them so they can keep playing. Depending on how you want to play, the student with the most cards, or the most pairs, by the end of the game wins. A: Yes I am / No, I'm not. Have the students call out “How are you,” and answer them by saying “I'm happy/sad/etc.” When you answer, the students should slap the corresponding card. Print the cards on thick paper, and/or print a design on the back of the cards so that other students can't cheat by seeing the pictures through the backs of the cards.